Learn more about one of the 2016 Fort Lauderdale MyShadi Bridal Expo Fashion Sponsors below. 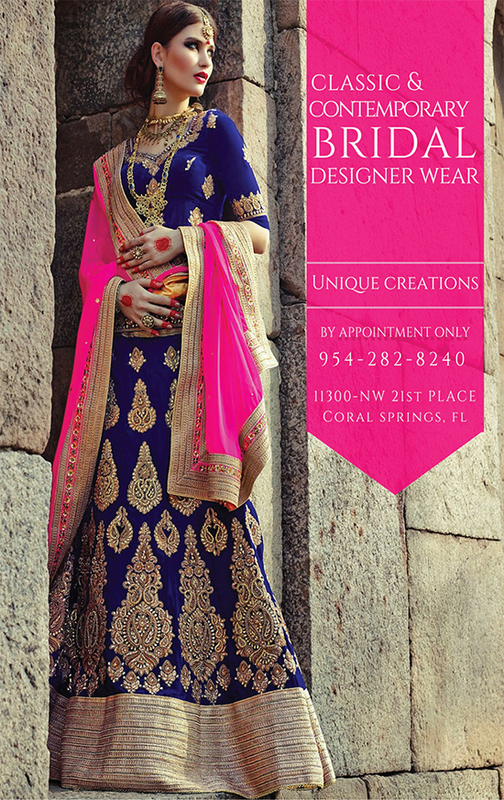 Unique Creation is a beautiful Home based Designer Boutique From New York Since the 1990, has now brought style, Elegance, and High End Exclusive designer wear from Bollywood (Mumbai) to Florida- Coral Springs. My Collection strongly reflects a Passion for high-end exclusive designs, Vibrant Color combinations, in great fabrics from silk, Net, Chiffons, Georgette, Brocades etc. Great Embroidery, Style and cut and a very sophisticated refined version of a women who cares about the detailing not just for a season but for a lifetime . To compliment these Outfits I also have beautiful designer Clutches. To all My friends all we need is a dream ,believe it, feel it, and I promise it will surely be fulfilled at Unique Creation. We Customize ur clothes to ur liking , ur style and ur taste. It will be a great pleasure to meet U, With Appointment Only. so when U come I can Give U my 100% attention. So please come say Hello, U will not regret it. Sarees, Suits, Lehengas, Kurtis, Gowns and beautiful Clutches. Thank you very much, Come Lets make your dream come true at Unique Creation.